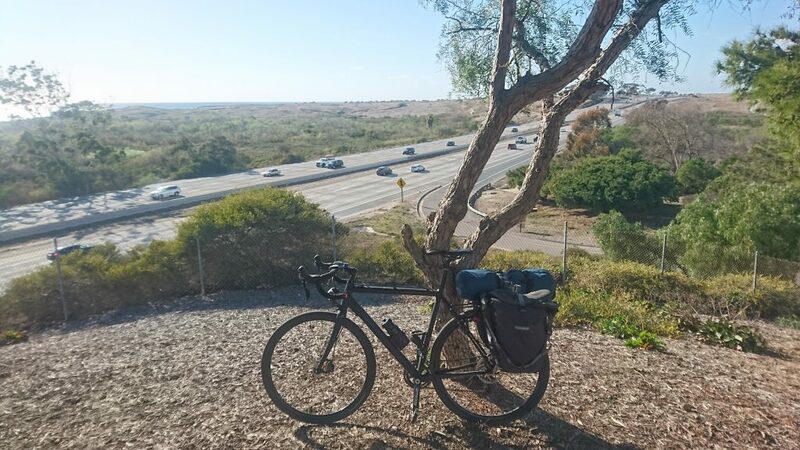 A ride along the coast from San Diego to Los Angeles. As always I headed out too late, keep going out of and back into the apartment hunting for a forgotten helmet or a fill of the water bottle. 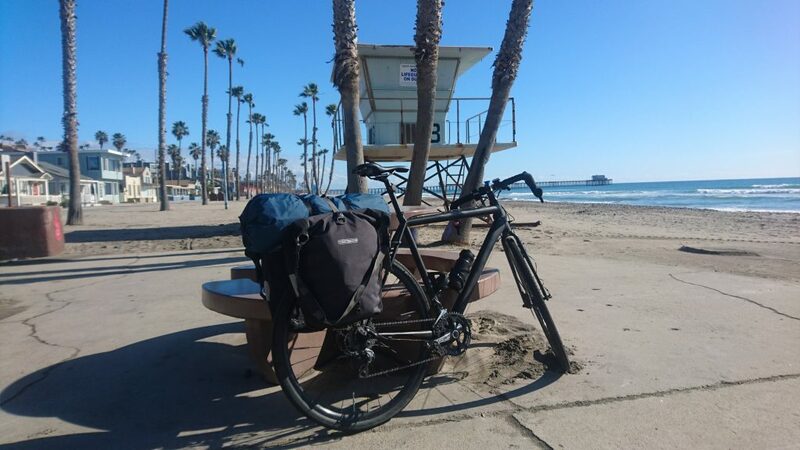 Eventually, I did sit on my bike and set off for a ride that should take me from San Diego to Los Angeles. The plan is to ride up mostly on the hold Pacific Highway 101, camp somewhere mid-way, ride up further along the coast, spend another night in the tent in the North of L.A., enter and explore Downtown on the third day. 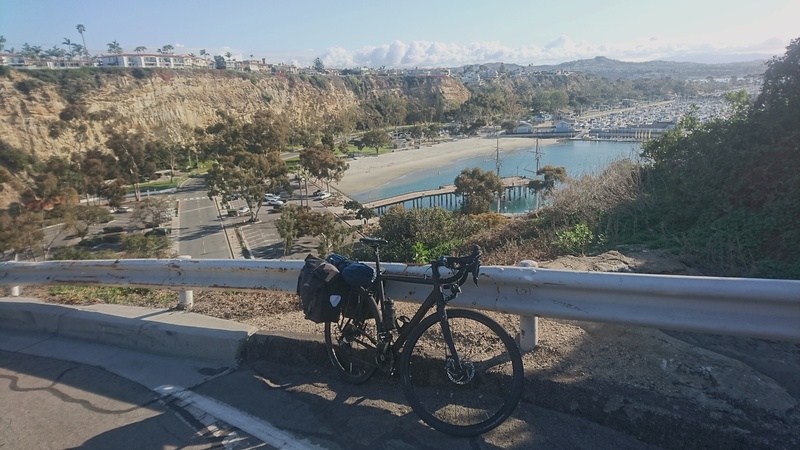 The ride starts with the first climb out of La Jolla, making me regret – another bad habit, that is hard to break – bringing too much luggage. Do I really need my laptop in the next few days? The 14W solar panel? The extra socks and underwear? I see it however as a field test for potential later tours, and some things will turn out more useful than expected. Like bringing the heavier but warmer sleeping bag, it will be so cold in the mornings; I will wear all the warm clothes I packed. What comes up goes soon down again, especially if one starts at around sea level and ends up about sea level. I enjoy rolling down along Torrey Pines. The toughest part seems to be done, and it is easy going from here, occasionally a bit up and down, and mostly uneventful until I enter Oceanside. I stop for a late lunch break at the beach, before hitting the major obstacle of the first day: Camp Pendleton. Camp Pendleton is the primary West Coast base of the United States Marine Corps. Unfortunately, it’s pretty large – it stretches along 27km along the coast, and one cannot just go through without a military ID or registration and approval well in advance. Of course, I do not have a military ID or approval. I am not even a US citizen, which means there is no way I would be allowed to enter the base. Routing around would be an enormous detour, but there is one solution, one legal corridor through the base: Interstate 5. Even a military base is not allowed to block car traffic. So I turn left at the gate and cycle onto the hard shoulder of the freeway. I expect to make a good pace at least, as the grades are gentle, but the wind is blowing against me, and the shoulder is where trash, debris and broken pieces of windshields or other glass accumulate. That’s something the emergency lane share with the bike lanes all over, so I nearly feel at home. Cars and trucks pass by on the four other lanes with 4 or 5 times the speed I make. It’s interesting for a while, but not exactly fun, especially when the shoulder is suddenly blocked by a car or piece of wood. 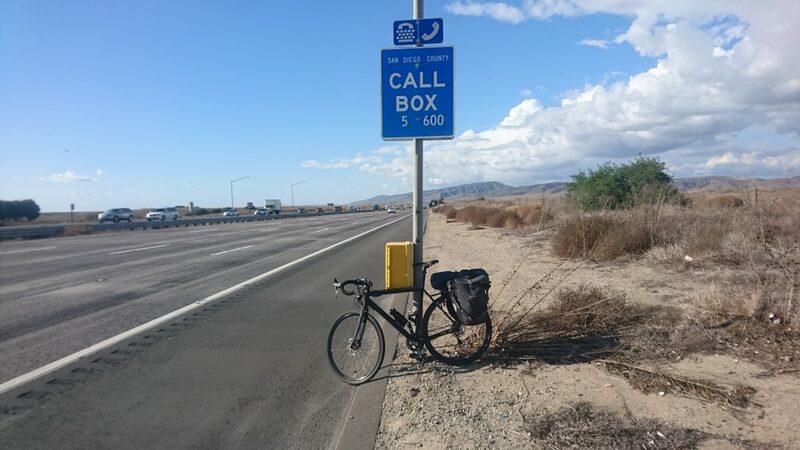 I pull out at a rest stop – “Bicycles must exit” – enjoy a pee and an overlook, and continue on the freeway. 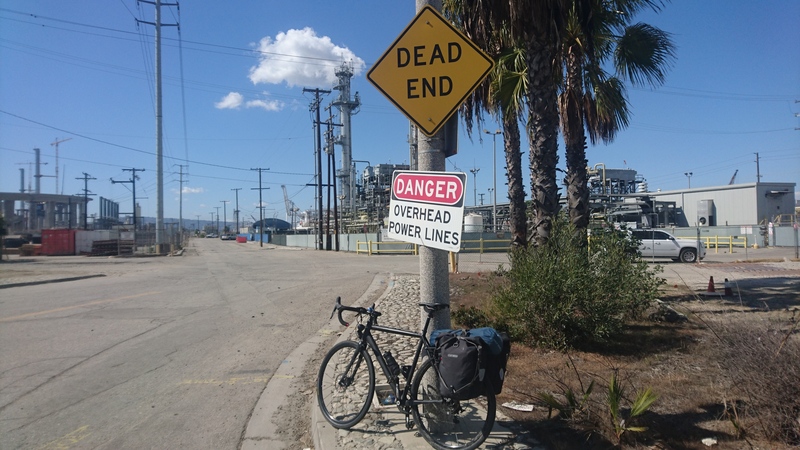 After riding 10 kilometers on the hard shoulder of I-5, I hit the exit “Las Pulgas Road” – “Bicycles must exit” – and find myself at the old Pacific Highway, closed off by a gate but no gatekeepers, closed but not closed enough for a bike to squeeze through. The bike path is marked and officially leading through it, but another sign tells me it is “for authorized personnel only.” A sign on the freeway entrance says it is allowed to enter for cyclists in case the gate is closed. I am a bit unsure of what to do. I decide the gate is open enough and riding a bike authorizes me to take the bike path and ride into military area. It turns out to be the most scenic part of the ride: A long stretch of an empty US-101, the pavement is old and rough, with nothing around but nature (except for a few soldiers practicing for war). As a closed-off military area, Camp Pendleton remains the largest major undeveloped portion of the Southern California coastline. As such it is a habitat for many rare and endangered species of flowers, birds, and mammals, such as the California gnatcatcher, the Pendleton button-celery, the Pacific pocket mouse or Stephen’s kangaroo rat. The American bison, the symbol of the American West and national mammal of the United States, nearly extinct in the 19th century was introduced here, and 147 of these buffalos roam in the base. A small paradise that cannot last long; Recent plans and studies suggest using the land for a new commercial airport. I don’t meet the bison or kangaroo rat, but a few other cyclists are sharing a beer, one of them carrying a trailer with a surfboard! I don’t feel I belong to this place, however, so I just greet them and do not stop for a chat but cycle on until I am finally out of these military complex. It takes me another 10km or so, then I pass the gate and suddenly end up in San Onofre State Park a long stretch of coastline, that happens to be one of the five most visited State Parks of California. The road is in best-maintained conditions now, and the infrastructure of public toilets is impressive. I pass by a crew packing up a camera crane and the leftovers and empty set of a film shooting, including more restrooms. According to a recent study by Scripps Institution of Oceanography, San Onofre is also among the places with the highest cliff erosion rate, a serious threat to all kind of infrastructure and danger that will increase with rising sea levels, likely to transform the California coastline. I can’t avoid thinking about that fact, when just after the bluffs, I meet the San Onofre Nuclear Power plant, sitting there only a few meters away from the current seashore and not far from a geographical fault line of this fragile area California is. Fortunately, the plant is out of operation. It had to shut down its units in early 2012, one for routine refueling, the other due to a radioactive leak. Both were found to have premature wear on the steam generators and in the aftermath of Fukushima, the site was finally decommissioned in 2013. Later investigations found out that executives of the owning corporation and the California utility regulator secretly met in Poland to negotiate a deal passing on the cost of the closure or about 3.3 billion USD to the taxpayer. The investigations dead ended however when the State Attorney General run for the US Senate. The most advanced democracy in action? The plant is closed down now, but I would not want to live here. It still stores thousands of tons of nuclear waste. 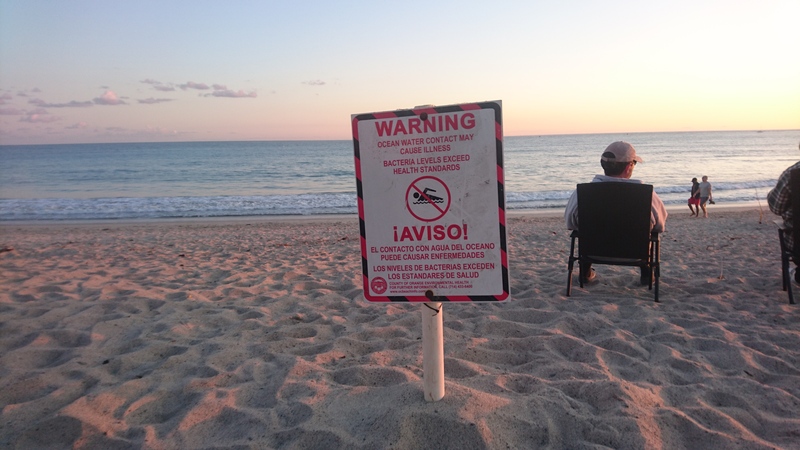 Although recent court decisions force the operator to move it out of the San Onofre site, where it initially was supposed to be stored indefinitely, there is no safe place or an alternative where it can go to at the time being. This all blows my head, and I start feeling tired. Passing through the curvy streets of San Clemente I notice my bike stirs pretty wobbly. Is it because of the heavy luggage, I first think. No, it turns out to be a front tire lacking sufficient air pressure. Tired, suddenly exhausted and with a flat tire, I am forced to stop. I decide not to fix the flat, just fill it with some air for the last few kilometers. Luckily the hole is tiny, and I manage to roll into Doheny State Beach, my planned destination for tonight. I have read they have first-come/first-serve hike-and-bike campsites for a few dollars, but I fail to find the main entrance. No wonder as I am coming from the South and the main entrance, as I later find out is at the Northern end of the park. Eventually, I ran into a well-decorated trailer with a sign that reads “camp host” and approaches the guy for camping options. 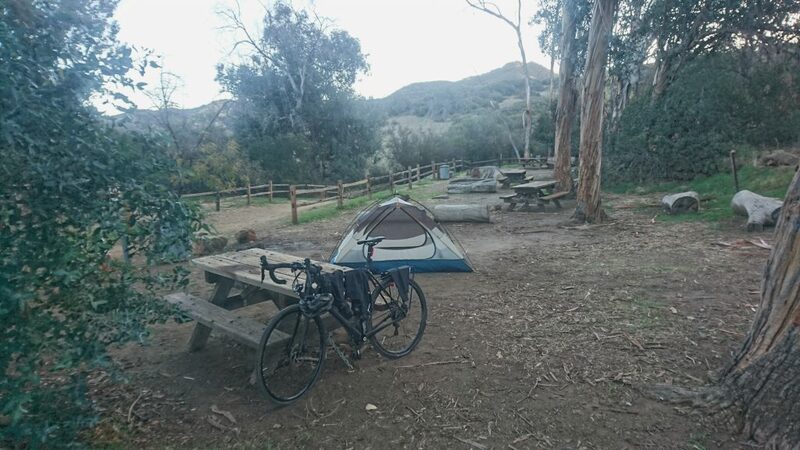 They do not have bike-in campsites, he told me. “We used to have them until a year ago. 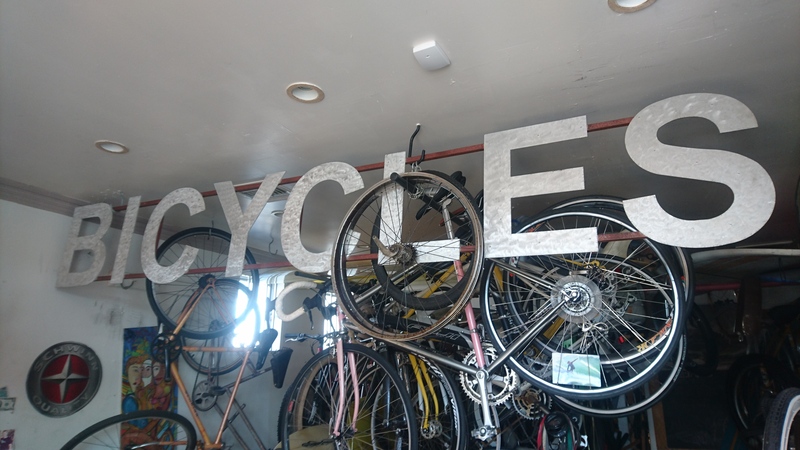 But it was used by homeless people coming in with some bike, not technically bike touring, inviting their friends and having parties. Yous know. Things were missing next day. You know .. ” – “I see,” I say. “But there are plenty of free spots,” I should go to the main entrance, there is a map. “But that also means I pay the normal price which is around .. I guess .. 40 to 50 bucks for pitching a tent for a short night?”, I ask. Yes, he knows it’s a lot, he says. “Where are you from?”, He suddenly asks. I tell him: “I am from Austria.”. “Oh. You could set up your tent here, behind my car. This is part of our pitch. Would this be ok for you?”. “Sure. It’s all I need”. “Welcome to Doheny,” he says. I am pitching my tent in the sunset when his wife comes out and brings me peanut butter bar, mandarines, and some almonds. “Welcome to Doheny,” she says. Overwhelmed by the friendly welcome, I silently thank this guy on steroids, the bodybuilder from the tiny Austrian village who turned into Terminator and governor of California, or whatever gave them the reason for liking Austrians. I try to sleep, listening to the noise of the Highway nearby instead of the waves, and an occasional Amtrak train passing by with a toot. I wake up shortly after sunrise. It is still cold and it takes time until the sun goes up and its rays reach down on me. I have a simple breakfast, oats, and seeds (flaxseed, chia, and hemp, topped off with turmeric, ginger, cinnamon, chile, and pepper) – soaked overnight, more water, no tea or coffee. I forgot to buy fresh stuff in the evening. It takes me a while to un-pitch, pack, change the tube and get going. I start the day again with a climb, up the cliff in Dana Point, passing by expensive villas and restaurants on the tops and edges of the bluff. This real estate is likely not to be passed on and inherited to the next generation, I wonder. All the Elon Musk gear won’t help them. 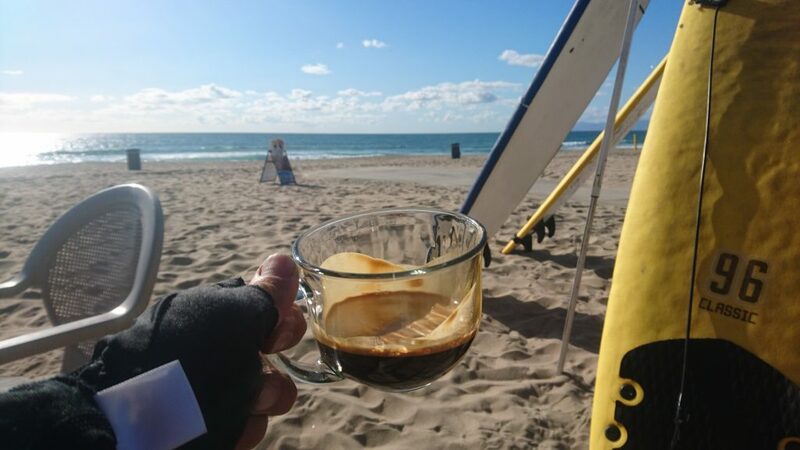 I make good progress in the morning, cycling for two hours just stopping for picking up a coffee in Laguna Beach and a new spare tube in Newport Beach. I pass by nearly all the beaches I have just read about in a surfer’s story. 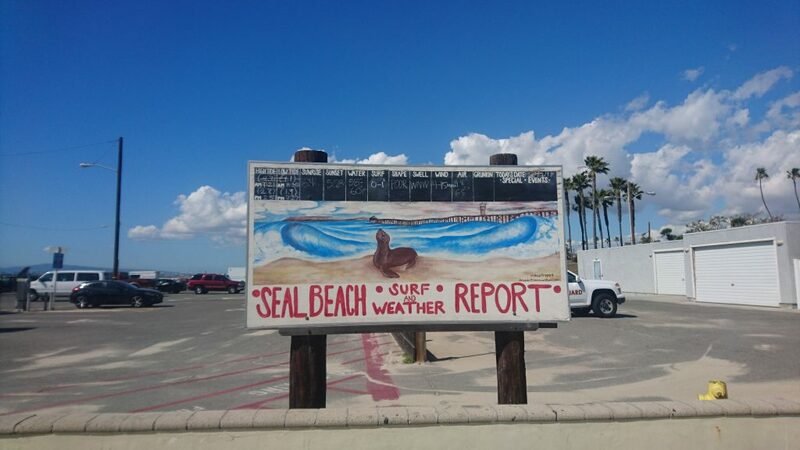 Famous surf cities like Huntington Beach, followed by Seal Beach. “We need to surf – or dance or yoga – because it reconnects us with our animal bodies [..] Without it, we become just a bunch of walking heads,” the author Peter Heller wrote about his quest to learn surfing from beginner to big waves – at the age of 48. He forgot to mention it, but the same holds true for cycling. And you can do it anywhere, anytime. You don’t need an ocean, you don’t need to wait for that perfect swell. Surfing: I am also trying to learn to surf – a few years younger at age, but also in the 40ies. Coming along here, however, I cannot suppress the facts: From a bunch of hippies and nerds in the 50ies and 60ies, when modern surfing emerged, surfing transformed into a billion-dollar industry with man-made artificial wave pools in Texas – like indoor skiing in Dubai; The future of surfing: commercialized, mechanized and Olympic? The idyllic coastal fishing villages of the West Coast turned into sprawling suburbia, and the alternative counter-culture merged and dead-ended into the California Ideology. Another brand new Tesla overtakes me, without keeping a proper distance. My average pace is so high now, I already see me arriving long before sunset, not knowing that it will fall back down soon enough to my usual touring speed. It starts by entering L.A. and L.A. traffic and traffic lights. Then I hit a closed road and a dead end in the Long Beach Harbor. My route planning did not foresee that this huge bridge is not for cyclists. But how should I know before? I re-route and figure out a new path through and out of the urban-industrial landscape of the harbor. Empty trucks are passing by just centimeters from me. Trains full of containers on the other side. I want to have a lunch break, but this the area does not look very inviting. I push on. Riding along Anaheim Street, I stop at a burger joint. It turns out to be Mexican, and I order the daily special of Tuesday: Bean and cheese burrito for 99 cents and coke for more than double of that price. I briefly ponder over the question whether I should continue straight and meet my original planned route to climb over Rolling Hills or route around the hill, expecting boring urban landscape but a flat course. I decide for the more scenic and more strenuous option. So I climb up between bike paths and horse riding trails, being passed by Jaguars, Teslas or German top-end cars like Porsche, Mercedes and BMWs. The downhill ride towards Torrance and its view reward me for the effort and not long after, I am back to cruising along the coast. The good thing about this vast metropolis: It has plenty of beaches. And nearly all of them have bike trails. 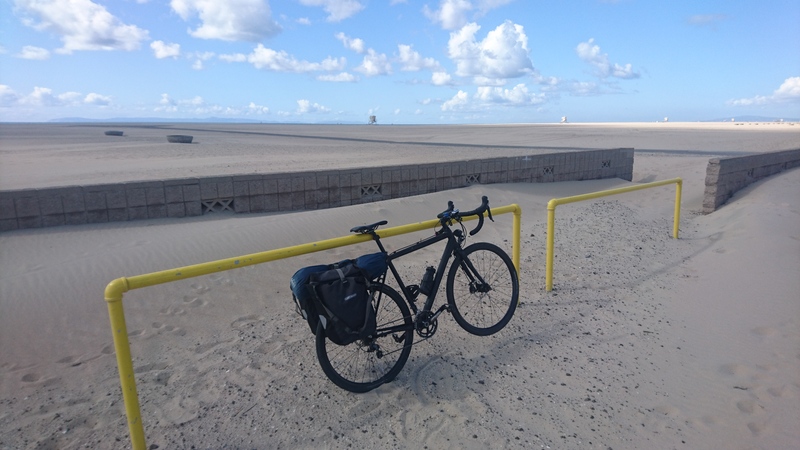 They are full of obstacles, however: heaps of sand that got blown over, sometimes require the loaded bike to be carried over, taco stands, coffee shops and too many people and tourists especially at Venice and Santa Monica Beach. Riding along Manhatten Beach I watch the planes taking off. It’s like the beach is spitting out an airplane after the other. 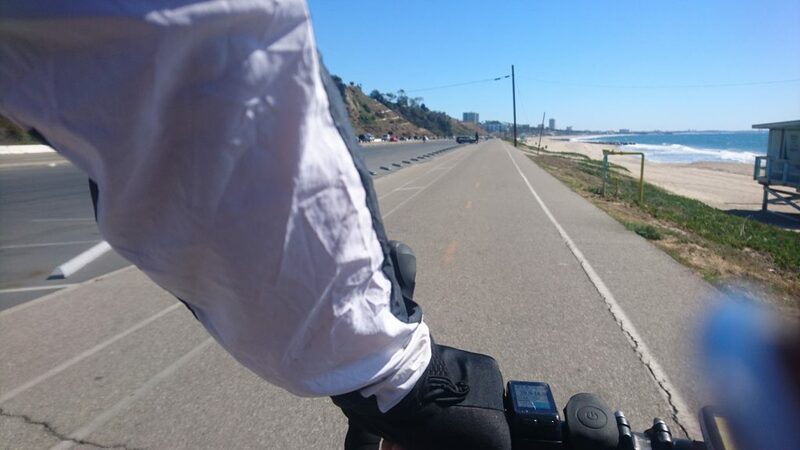 For now, I am pushing against the wind getting stronger, along the beach bike trails, and congested coastal streets until I turn into Topanga Canyon Road. I pull out at a gas station’s store to stock up on sports drinks for the climb and food for dinner and breakfast, just in case. (It will turn out to be the case). The climb starts gentle but gets steeper and tougher – exhausting and challenging but not as worse as expected. Again I read some desert wilderness stories by Edward Abbey before trying to sleep early. I skipped the rain fly of the tent so I can watch the stars in the sky over me. And at frequent intervals: airplanes. I have the whole campground for myself. It’s finally quiet, I think, just as a helicopter appears and it roars with blinking white and red lights directly over me. A car suddenly drives by; it’s headlights blending me. It’s the ranger, so there must be a road. I turn back to my book. “I’ve said it before, and I’ll say it again, we’ve got to close the parks to private cars if we want to keep them as parks. The parks are for people, not machines. Let the machines find their own parks. Most of America has surrendered to them already, anyway. New Jersey, for example. Southern California.” Abbey wrote this more than 30 years ago. It still holds true. Nothing has changed, and if so, not for the better. I dream of all the multi-lane roads I went on when coming here through never-ending suburbs, occasionally interrupted by a state park or military base. A culture built for cars, built because of cars. I wake up early again. The sun still far behind the mountains. It is cold. I wear everything I have, but I make a mistake to wash my hands in cold water, and I don’t get them warm again. Night time temperatures went down to something like 3 Degrees Celcius. Good thing, my sleeping bag was designed for this kind of temperatures (and I thought it might be too heavy to bring). But my fingers are freezing. It’s challenging to prepare breakfast like this. This time the muesli includes yogurt and banana. I improvise gloves by using a fresh pair of socks. It helps, but it is also clear I have to wait until the sun is out to do serious work like fixing the tire – a procedure that is turning into my morning routine. The sun arrives eventually. I place my solar panel at the tubes of a horse cage, hoping it will at least charge some of my devices and batteries. I overdid it yesterday with using the navigation on my phone, expecting a little bit more infrastructure. The campsite is connected to the grid; I find a meter and lights. But there is no switches and no outlets. I need to stop at a coffee shop in L.A. anyway for a while. This time I completely remove the tire from the wheel, carefully inspect it but find nothing. The rim tape is partly worn off, although I just had it replaced by a professional. Never trust what you didn’t do yourself. I try to somehow re-adjust it somehow, after my plan to improvise it with tape fails, because I find it missing from my first aid kit. Not the first thing I will find missing there, but more about that later. I hope this temporary fix will bring me through the day, at least into L.A. I pack everything else up. During the time it took me to pack the tent and everything, fix the flat, brush my teeth and so on, my Garmin watch (I use to record the ride) is fully recharged by the sun. My phone at least got a boost, that should bring me safely into the town and more. I find the road leading out at the Northern side of the park, meeting Topanga Canyon Road at some point again. All paved. The side-effect of taking the paved exit however is, I have to climb up again to the main entrance. I want to go down the fire road, a dirt road that leads down to Pacific Palisades. 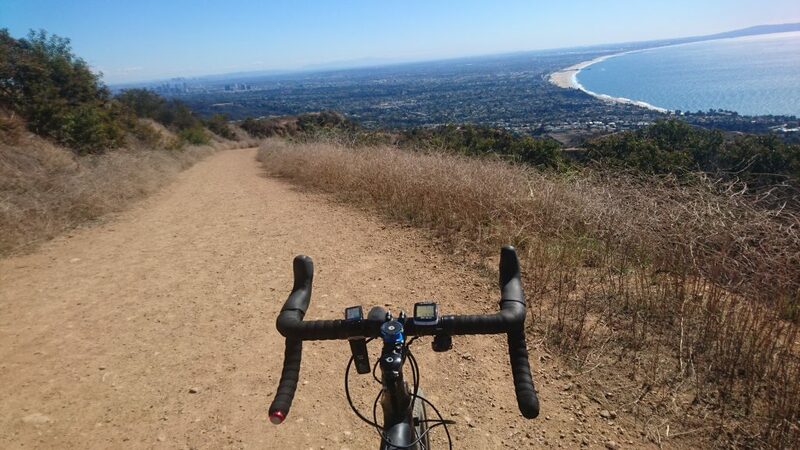 It should be rideable and offer magnificent vistas over Los Angeles and the beach. But I have to climb up, first the Entrance Road, then up the fire road, partly over steep gravel. Even downhill it is impossible to go fast, the weight of luggage and the loose ground making riding slow and unstable. At one point the bike slips and I fell. I climb up another detour to a viewing platform. I meet an old hiking couple with a French accent. They ask me where I sleep. Do I go to campsites or just sleep where ever I happen to be? That’s what they did in their youth, hitch-hiking along the coast, crashing on the beach. I tell them I go to campsites, as there is hardly any free space anymore. Everything privatized, developed or well regulated and fenced as a State Parks. They sigh knowingly. Riding down the Fire Road towards L.A. The ride over the fire road trashes my average pace for the day. No need to hurry anyway, the views are terrific. When I pull out on paved roads again, I also pull out two thorns of my left calve. I do not know where they came from. Must have happened when I slipped. One wound looks quite deep, and I am not sure whether I got everything with my dirty fingers. I could not find the tweezers, which were supposed to be part of my first aid kit. And the disinfectant turns out to be seven years over its expiration date. It seems about time to restock and re-organize this kit. Back to the coast, back to Venice Beach, I find a coffee shop to re-charge. Caffeine and lunch for me, a mix of clean and unclean energy for my battery pack and phone, and WIFI to figure out plans for the afternoon and catching up with a few people. 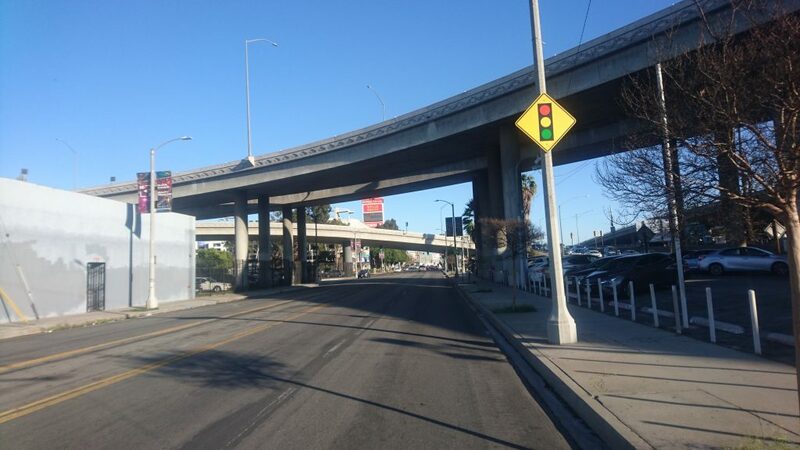 I ride Venice Boulevard into Downtown, about 20 kilometers on the very same road, interrupted every few hundred meters by a red light and a major stop for another coffee with a friend. Late afternoon I end up at the reception of an exhibition titled “Sustainability and Public Good” at the Fine Art Gallery of UCSD. Everyone is amazed by this guy who arrives by bike, coming from San Diego. Of course, everyone else came by car. Parking information is an essential part of an address here. I cannot find much sustainability in the Art displayed, in fact, I cannot find much sustainability in contemporary art in general. But I do enjoy the company of fellow artists and the socializing after riding along for days. And the snacks. The girls with plates figure pretty soon that I am the hungriest guy in the room and make sure to present me the plate, every time they pass by, happy someone is taking off their load, happy to feed me. I am however glad; cars do exist when I arrive at San Diego Old Town Station. After resting for three hours my calve suddenly hurts so badly I can barely walk out of the Station, there must be something still left in the wound, or it got infected. I am happy my girlfriend is willing to pick me up by car and save me another 8-mile-ride in pain. After cleaning it properly – and a miserable night, mentally already prepared for a meeting with emergency care – the wound heals off normally. We should be grateful however to this thorn, at least if you enjoyed reading this so far: Without the rest days, it forced, I might not have found the time to write down this short story. Edward Abbey: Fire Lookout: Numa Ridge, in: The Journey Home. Some Words in Defense of the American West.